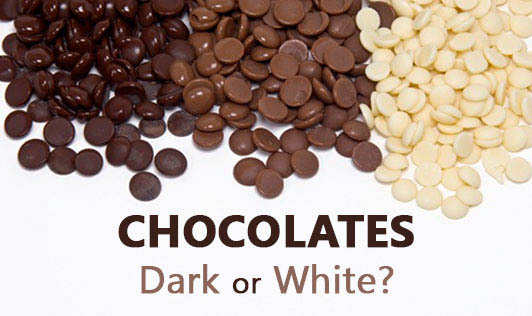 Chocolates - dark or white? The benefits of chocolates have been making news in the recent past. Chocolate manufacturers have lost no time in filling the supermarket shelves with 'healthy' chocolates. Chocoholics are loving the information on the goodness of chocolates. Ok, so you've bought the latest 'health' chocolate from the store and are waiting to savor it. Before you do that, make sure to read the label. Claims apart, there might be nutrition and / or health related information. Check out the fat content, sugar content, calories (specially those from fat) and trans fat content (if any). Even though some of the manufacturers call their chocolates 'healthy' or 'dark', the content of cocoa solids might not be as high as required or the fat or sugar content might still be fairly high. I agree that research has shown that dark chocolates are beneficial for health, but the ones that contain the said benefits need to have at least 70% cocoa. The high cocoa chocolates also have a bitter taste. Such chocolates contain antioxidants called flavonoids from cocoa solids. Flavonoids have cardio-protective properties. But remember that even the bitter chocolates contain sugar. So, savor your chocolate but only in limited quantities. Go for bitter chocolates, higher the cocoa content, the better!